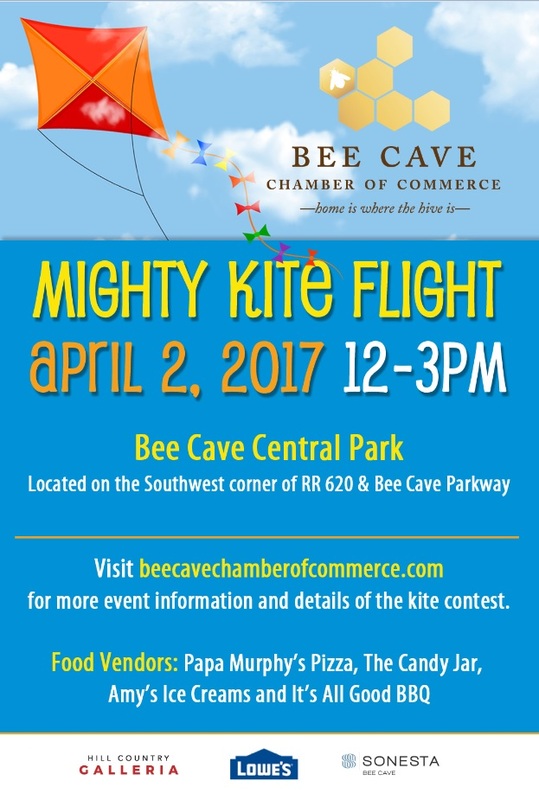 BEE CAVE, TX – February 6, 2017—We are excited to announce today that the Bee Cave Chamber of Commerce (BCCC) will host the Mighty Kite Flight in Bee Cave Central Park. On Sunday, April 2nd from noon – 3:00 p.m. families are invited to join in on this free, community event. The first 300 attendees will receive a complimentary kite courtesy of Sonesta Bee Cave Hotel. Enjoy music, food, fun, and activities in Central Park with complimentary parking at The Backyard and free admission to the event. Food vendors will include Papa Murphy’s Take-N-Bake Pizza, It’s All Good BBQ, Amy’s Ice Creams, and snowballs by The Candy Jar. While you are in the park, be sure to visit the vendor booths including our sponsor’s Hill Country Galleria, Sonesta Bee Cave and Lowe’s Home Improvement. The Bee Cave Chamber of Commerce is organized to provide business leadership and advocacy that advances the city of Bee Cave and enhances the economic development and quality of life of its business community and its citizens. The Bee Cave Chamber of Commerce is a 501c6 organization.